(ARA) – Every year a wave of new products hits the shelves at lawn and garden stores, home improvement centers and online retailers. For 2008, a major trend is innovative outdoor lighting. Driving this trend toward creative outdoor lighting is the desire of homeowners to spend time outdoors and extend their outdoor time into the comfortable summer evening hours. Driving this trend toward creative outdoor lighting is the desire of homeowners to spend time outdoors and extend their outdoor time into the comfortable summer evening hours. The abundance of interesting products for patios, decks and gardens is a testament to just how important outdoor living areas have become. According to a survey by the American Institute of Architects on Home Design Trends, there is surge in interest in building outdoor patios, kitchens and decks, and outdoor lighting extends the use of these spaces. “With every deck I build I now factor in lighting solutions,” says Bob Lehman, owner of Creative Deck Designs in Maryland. Today’s lighting comes in a variety of forms, including energy efficient illumination sources. “There are so many uses for lighting in an outdoor environment, both from a functional standpoint and a decorative one,” says Jay Savignac, senior vice president for Aurora Deck Lighting, one of the nation’s largest outdoor lighting manufacturers. Building codes have also been an important driving force, as safety concerns have forced communities to require builders to add lights when outdoor stairs are involved. “Increasing the safety factor is definitely a reason for adding lights, and security has always been important. Today people want lighting that allows them to cook outside at night or entertain in a candle-lit sort of environment. Products on the market today make it possible to do both,” Savignac says. Outdoor lighting is a fast growing category, having come a long way from the motion-detector flood lights or “runway-style lights” that first hit the market in the 1980s. Aurora Deck Lighting (www.auroradecklighting.com) is one the nation’s largest manufacturers of outdoor lighting solutions for safety, security, and ambiance. Their products range from solar powered path lights to energy efficient LEDs for fences and decks. “Our newest products include outdoor solar lights, like the Polaris, which has a traditional lamp look that is designed to fit on a variety of post sizes. Because it is powered by the sun, the lights are easy to install and no special wiring or electrical knowledge is required,” Savignac says. Lehman says his clients also are incorporating path lights into their backyard environments. New versions, like the Quasar Pathway Deck Light, mount on the bottom of a porch post, deck post or fence to illuminate stairs or highlight landscaping. LED lights, like the award-winning Eclipse LED and the Nova LED from Aurora, are growing in popularity as technology has improved their intensity. These lights burn for thousands of hours without requiring a bulb change and are among the most efficient sources available today. 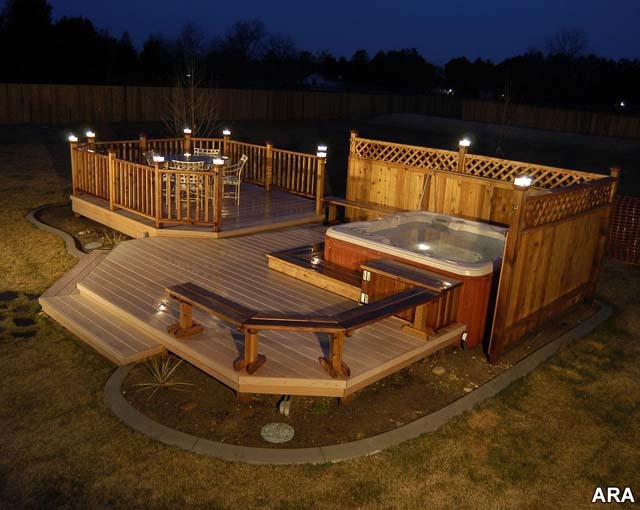 A nice wood deck looks great at night with post cap lights. Ron and Nancy Snyder of Rootstown, Ohio, had a new deck added to their home and shopped extensively for outdoor lighting to compliment its design. They decided on a simple post cap light that is mounted on the posts on their deck. “We are extremely pleased with these lights and have received many compliments from our guests and friends. We especially like the way the glass defuses the light, and we are amazed at how well the lights weathered our vicious Northeast Ohio winter. They still look perfect in spite of record severe weather,” Ron says. “We’ve come a long way from the ‘runway lights’ that people would stick in their yards along the sidewalk. Today the quality of the lighting and the options that are available make it possible to completely customize the look of your home and create a fantastic ambiance that lights up the night,” Savignac says. For more information and outdoor lighting inspiration, visit www.auroradecklighting.com and outdoor lighting fixtures.